A simple, economical and effective approach to fretwork. This tutorial could work on a refret but was performed on a fresh fretboard. Start out with a properly radiused fretting caul, a matching radius block and a good straight edge such as as steel ruler. Lay your straightedge down the length of the board and make sure it is straight to begin with. 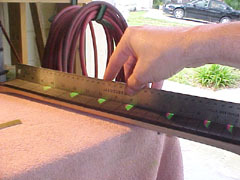 Check underneath the straightedge for any light indicating gaps. The exception being clear acrylic inlays! If necessary, use your radius block to level the board where needed. 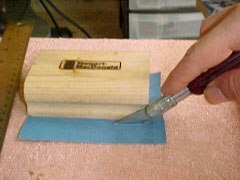 To adhere sandpaper to my radius block I use a spray adhesive. Start out with 320 to 600 grit depending on the condition of the fingerboard's surface and the amount of levelling required. 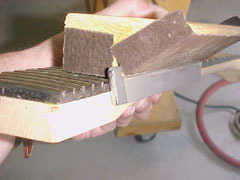 I always trim the sandpaper around the sides of the radiusing block. Clear your paper often and blow any excess dust from your fingerboard. A quick ragging with a Scotchbrite pad down the length of the board pulled dust out nicely. 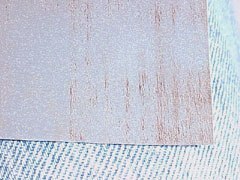 Lumps of dust buildup on the sandpaper (especially when working with naturally oily woods such as Rosewoods) cause unsightly ridges down the length of your work. If the paper had "loaded up" and cannot be cleared easily, change to a new piece of sandpaper. 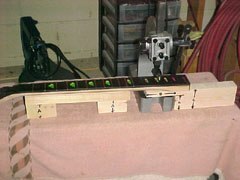 Once you have made sure the fretboard is straight and level from the top to the bottom, lay your fretting caul or a radius gauge in the area of the first position. Check there is no light escaping underneath. 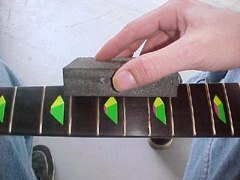 Repeat this check down the entire length of the fingerboard. If all is well you should have no light escaping underneath the caul or straightedge no matter where they are placed on the fretboard. I finish up levelling using 2000 grit paper. This is an Ebony board and look I can see my neighbors house in it without adding oil! 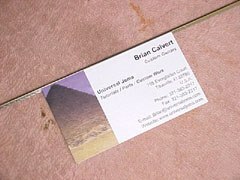 Grab a business card and the fretwire you intend to use. 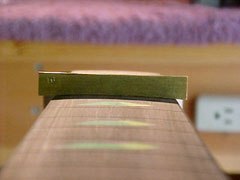 Place the edge of the card right up against the underside of the fret along the tang. 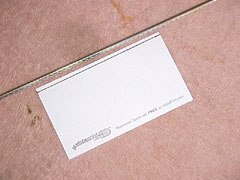 Flip it over and draw a fine line along the edge of the tang and onto your card. 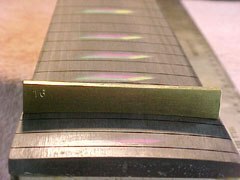 This leaves a line corresponding to the tang depth, giving you an instant fret slot depth ruler! One by one, cleaning each fret slot of any debris and dust. Whilst compressed air helps, it cannot always remove packed dust. 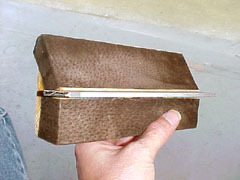 A craft knife blade with the tip broken off makes an excellent tool to evacuate fret slots. Slip the card down inside each of the individual fret slots and check their depths. 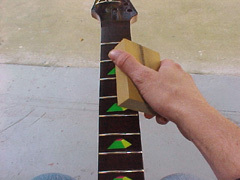 Fretboard leveling and radiusing reduces the depth of the slots. 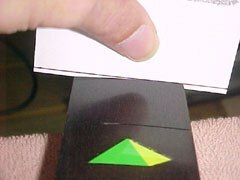 Move the card side to side across the entire slot, but do not force it down. 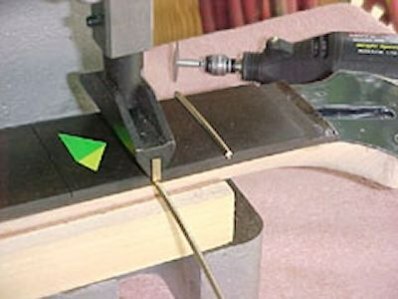 If the line rises out of the slot, you need to whip out your slotting saw and deepen that particular area. Neck support cauls are a life saver and are essential when using an arbor to press in frets. I pre-radiused the fret wire to a radius slightly smaller/tighter than the fretboard radius. After pressing frets in I use a Dremel to trim the excess off. Alternatively you can use pliers or other nippers to trim the wire to length before or after pressing. 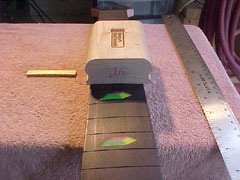 The neck support caul cannot be placed under the highest frets. 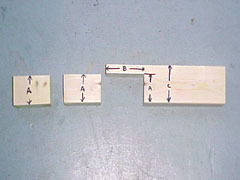 Grab a scrap piece of 2 x 4 about a foot long and measure the height of the base of your arbor press A the width of the base B and the distance from your work surface to the bottom of the neck heel you're working on C. Cut up the board and use the pieces to assemble a supporting jig as pictured. Place your two A blocks under your neck support caul. The odd-shaped block fits squarely under the neck and over the arbor press so that you can continue to press frets safely down the rest of the neck. Now grab a second piece of 2 x 4 and a double-sided flat file, ideally one with a coarse cut on one side and a fine cut on the other. 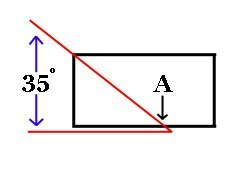 Make a cut down the length of your piece of wood that is at a 35° angle (or whatever your preferred fret end bevel angle is). Then cut a slot down the edge at position A as shown, just thick enough to grab and hold your file. 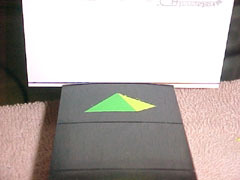 Insert the file with the coarse side towards the smaller flat area. I added a $2.79 piece of Tandy brand suede cut in two I purchased from the crafts section of Wal-Mart. This was stuck using contact cement and helps your tool slide along the length of the neck without scratching the tops of your frets. 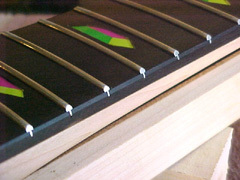 For the next few steps: If you're working with a lighter-coloured fretboard (such as Maple) I recommend applying masking tape between the frets or any other areas of exposed raw wood. Debris from filing fretwire can contaminate the wood causing ugly marks! 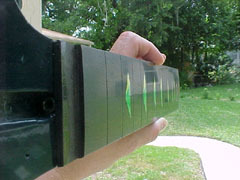 A magnet is useful to collect debris. First thing you want to do is square off the fret ends against your neck. Start off slowly and be careful not to whack the end of your tool into the headstock! As soon as the "cricket chirping" sound of the filing has disappeared you know you're finished. You can then move on to the other side. After you have done both sides, flip your tool around and repeat the process to cut a bevel onto the ends of your fretwork. Don't forget to listen for the cricket to stop chirping. 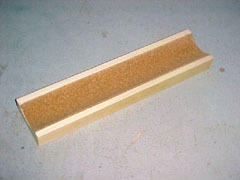 Grab a coarse sanding sponge and run it up and down the length of your board at the same angle as your bevel cut. Do this quickly back and forth a few times, then move on to the other side and repeat. Grab a finer grit sanding sponge and repeat the process again. After you're finished, simply wipe the dust off and buff out the top of your neck! The bevel on the sides and the tang slots are perfect along the fret board so no fill is really needed. 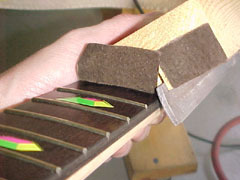 If any gaps are visible under the fret tang ends, you can use a matching wax filler stick to close them off. Simple Fretwork by Brian Calvert is licensed under a Creative Commons Attribution-NonCommercial-ShareAlike 4.0 International License.